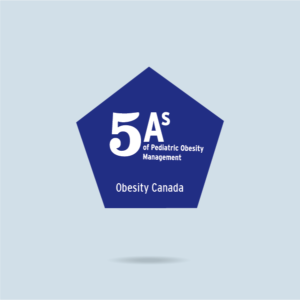 Obesity Canada’s 5As of Obesity Management program was designed as a step-by-step framework for busy non-specialists who manage obesity in their patients. The framework was developed with close to $1 million in funding from the Public Health Agency of Canada and the Canadian Institutes of Health Research. It is based on several core principles that emerged from extensive consultations with patients, primary care providers and obesity experts – a process that involved numerous interviews, focus groups and surveys spanning almost three years. The principles and messages were then crafted and tested among primary care providers at conferences and workshops across Canada. The result is an easy-to-use roadmap that ensures sensitive, realistic, measurable and sustainable obesity management strategies that focus on improving health and well-being, rather than simply aiming for numbers on a scale. The 5As have been adapted for use in pediatrics and healthy pregnancy weight gain, and for team-based care. Check out the links below! The following core principles were identified during the consultation processes that went into the development of the 5As framework. Obesity is a chronic and often progressive condition. Successful obesity management requires realistic and sustainable treatment strategies. Short-term “quick-fix” solutions focusing on maximizing weight loss are generally unsustainable and therefore associated with high rates of weight regain. Obesity management is not about simply reducing numbers on the scale. The success of obesity management should be measured in improvements in health and well-being rather than in the amount of weight lost. For many patients, even modest reductions in body weight can lead to significant improvements in health and well-being. Early intervention means addressing root causes and removing roadblocks. Successful obesity management requires identifying and addressing both the root causes of weight gain as well as the barriers to weight management. Weight gain may result from a reduction in metabolic rate, overeating or reduced physical activity secondary to biological, psychological or socio-economic factors. Many of these factors also pose significant barriers to weight management. Success is different for every individual. Patients vary considerably in their readiness and capacity for weight management. Success can be defined as better quality-of-life, greater self-esteem, higher energy levels, improved overall health, prevention of further weight gain, modest (5%) weight loss or maintenance of the patient’s ‘best’ weight. A patient’s ‘best’ weight may never be an ‘ideal’ weight: Setting unachievable targets simply sets up patients for failure. Instead, help patients set weight targets based on the ‘best’ weight they can sustain while still enjoying their life and reaping the benefits of improved health. A pilot study first presented at Obesity Week 2013 provides the first evidence that the implementation of the 5As of Obesity Management promotes physician–patient communications, medical assessments for obesity and plans for follow-up care in a primary care setting. Researchers tested the impact of implementing the 5As tool in four primary care clinics with over 25 healthcare providers; the intervention consisted of one online training session (90 min) and distribution of the 5As toolkit to HCPs of participating clinics. Based on measurements performed before (baseline, n = 51) and one month after implementing the 5As of Obesity Management (post-intervention, n = 51), the authors observed a two-fold increase in the initiation of obesity management (19 vs. 39%, P = 0.03), a statistically significant increase in the perceived follow-up/coordination efforts (self-reported Patient Assessment of Chronic Illness Care components, 45 ± 22 vs. 67 ± 12 points, P = 0.002), as well as two components of the 5As framework: Assess (50 ± 29 vs. 66 ± 15 points, P = 0.03) and Assist (54 ± 26 vs. 72 ± 13 points, P = 0.01). The results, published in Clinical Obesity, suggest that using the 5As framework facilitates weight management in primary care – the first essential step towards any hope of promoting meaningful obesity management in primary care practice. More evidence for the utility of the 5As has been published by 5As-Team collaborators – click the icon below. Learn more about the 5As of Obesity Management for Adults, and order kits. Treating obesity in a pediatric setting? This is the toolkit for you. Help pregnant patients and clients understand and manage pregnancy weight. The 5As adapted for team-based healthcare delivery.